Gen 2:16, 17 And the LORD God commanded the man, saying, “You may surely eat of every tree of the garden, but of the tree of the knowledge of good and evil you shall not eat, for in the day that you eat of it you shall surely die. The death that occurred for man was both natural and spiritual. Spiritual death means permanent separation from God which is far worse than physical death. So if Adam died spiritually and naturally, God had to redeem him spiritually and naturally through spiritual and natural resurrections. Rom 6:23 For the wages of sin is death ; but the gift of God is eternal life through Jesus Christ our Lord. It could not mean physical death only here in Romans because we all die physically but those in Hell are separated spiritually, in their spirit, from God. The eternal life He is talking about is concerning our spirits thus the death spoken of here is also concerning our spirits. The Bible never teaches Hell is the penalty for our sins but rather death is the penalty. Hell is simply the holding place of the dead. Death is separation from God. If we are dead spiritually, Jesus had to become like us to come save us! Isa 54:7, 8 For a small moment have I forsaken thee ; but with great mercies will I gather thee. In a little wrath I hid my face from thee for a moment ; but with everlasting kindness will I have mercy on thee, saith the LORD thy Redeemer. Isa 54:7, 8 (ESV) For a brief moment I deserted you , but with great compassion I will gather you. In overflowing anger for a moment I hid my face from you , but with everlasting love I will have compassion on you,” says the LORD, your Redeemer. We see here that God deserted Jesus and Israel . Why? Because of sin. Of course Jesus never sinned but He voluntarily took our sins upon Himself. God the Father is a holy God and cannot look upon sin. His face is a representation of His presence which is why it says “I hid My face from you.” It had to be withdrawn because that is the penalty for sin – a separation from God’s presence. If you understand that, you would have no problem believing that Jesus died spiritually. 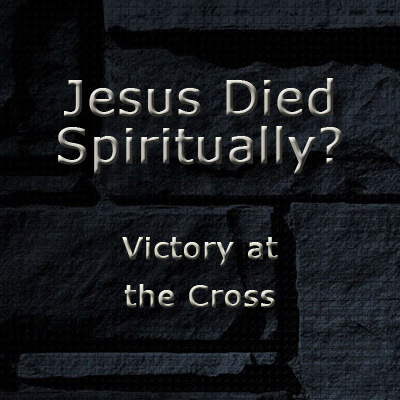 We know II Cor 5:21 says Jesus was made “to be sin for us” so He had to die spiritually. Jesus was deserted, abandoned, and forsaken by God the Father. THIS IS the definition of spiritual death. How people cannot see that in their Bible just amazes me. I believe they are trying be spiritual and defend God but they don’t know that they are being ignorant. You would have to purposely ignore these clearly stated Scriptures in Matthew and Mark which say in a most direct way that Jesus did experience spiritual death (or they just don’t know what spiritual death is). Thank God for Mel Gibson’s Passion movie but that is not even the half of what Jesus went through for us! Jesus was not praying in anguish in the Garden of Gethsemane about the crucifixion and beatings by man. That has been done many times before and since to many men. No, the most horrible agony that He was facing was spiritual death – where God the Father would have to turn His back on His Son. We cannot understand such a thing because we have not existed forever in perfect fellowship with God, but Jesus did. To be separated from Him for a moment would be so unbearable that it could not be put into words. Many saints were martyrs and died with great joy on their faces for they were in God’s presence. Jesus on the cross endured terrible pain and agony because He was separated from the Father and the Holy Spirit. This is a proof that what happened on the cross was Jesus’ spiritual death. Do you see the dilemma? God, because He is so holy, had to turn His back on His own Son. For Him to not do so would violate His very nature of “holy, holy, holy” (Isa. 6:3; Rev. 4:8)! As much as He loves His Son, a love that we cannot possibly fully comprehend, He had to withdraw His presence so that the judgment could be complete. That time on the cross is something that all the words for all of eternity could try to explain but it still would not be sufficient. Yet, we will celebrate that victory forever with Him. God truly is worthy of all glory and honor and praise forever! Heb 2:9 But we see Jesus , who was made a little lower than the angels for the suffering of death, crowned with glory and honor; that he by the grace of God should taste death for every man . Jesus’ deaths, physical and spiritual, destroyed the power of the devil. Hallelujah! Death has no more hold on me because of Jesus! I am alive spiritually forever because I am born-again. Sure, I am going to die physically one day, the LORD tarry, but that is not permanent. Glory to God, I’m coming out of that grave because He has purchased me back spirit, soul, and body by His own precious blood! Praise God! Isa 53:9 And he made his grave with the wicked, and with the rich in his death ; because he had done no violence, neither was any deceit in his mouth. Jer 52:3 For through the anger of the LORD it came to pass in Jerusalem and Judah, till he had cast them out from his presence, that Zedekiah rebelled against the king of Babylon . The Father turned His face from His Son because His Son took upon Himself the sins of the world both physically and spiritually. He never sinned so His righteousness became ours and our sins became His. He died for the sins of the entire world, however only those that put their faith in Him will be reconciled. Luk 23:46 And when Jesus had cried with a loud voice, he said, Father, into thy hands I commend my spirit : and having said thus, he gave up the ghost. The tearing of the veil of the temple represents the Old Covenant being fulfilled. The exact moment Jesus’ spirit left His body was the exact moment the Old Testament was fullfilled. This is why He said, “It is finished” here instead of after He rose from physical death (Joh 19: 30). Notice the Holy Spirit was upon Him when He, His spirit, preached to the spirits in prison. That means the spiritual death was over and He was alive again to the Father and Holy Spirit. The prison was a place in the lower parts of the earth called Abraham’s bosom or Paradise (which will be explained later). The important thing to see here is that He was no longer spiritually dead after His physical death. The devil did not beat on Jesus’ spirit for three days. Jesus went down to the lower parts of the earth a victor Hallelujah! Col. 1:22 yet He has now reconciled you in His fleshly body through death, in order to present you before Him holy and blameless and beyond reproach. It is through the body of Jesus we are cleansed of our personal sins . It is through the spirit of Jesus we are born-again in our spirits. Both the death of the body and of the spirit were necessary for the complete redemption. If Jesus only died and rose in body, then our spirits still have no redemption. But since His spirit also died and rose we can now be called children of God for we are born-again into the Kingdom of God . The above verses also prove that the victory over personal sins was won on the cross. Jesus was not tortured in Hell by Satan; no redemption took place there for it was won on the cross. Rom 7:4 Wherefore, my brethren, ye also are become dead to the law by the body of Christ ; that ye should be married to another, even to him who is raised from the dead, that we should bring forth fruit unto God. Notice all these verses are talking about overcoming sins of the flesh where we transgressed the Law of God. For this reason Jesus’ body became a sin-offering for us. Sin is an action. We choose to give in to that sin nature and act which is sin. For these sins we need cleansing and forgiveness. Jesus’ body was sacrificed for our personal sins and its consequence of sickness/disease. People act like this is some new teaching about Jesus dying spiritually. However, this has been taught by the Church fathers for centuries as a basic doctrine of the Christian faith. Not until now has it been challenged because the devil is doing all he can to prevent people from seeing what Jesus really did in these last days. John Wesley believed in Jesus’ spiritual death:“My God, my God, why hast thou forsaken me? – Our Lord hereby at once expresses his trust in God, and a most distressing sense of his letting loose the powers of darkness upon him, withdrawing the comfortable discoveries of his presence , and filling his soul with a terrible sense of the wrath due to the sins which he was bearing.” -In Wesley’s commentary of the Bible, Wesley’s Explanatory Notes . Billy Graham believes in Jesus’ spiritual death:“Jesus’ cry, “˜My God, my God, why have you forsaken me?’ (Mark 15:34) has puzzled many. Jesus is actually quoting the opening line of Psalm 22 and using it to express His deep agony on the cross. He is suffering the penalty for our sin in our place. The penalty for sin is death (Romans 6:23). Death includes two dimensions — physical and spiritual. Physical death is the separation of the spirit from the body. Spiritual death is the separation of the spirit from God. Since Jesus was dying for our sin as our substitute, He was experiencing the agony of separation from His Father.” -Graham, Billy. Did God really forsake Jesus when He was dying on the cross? Billy Graham Evangelistic Association. Publishing date unknown. 7 July, 2003. If space permitted, many more well know theologians and preachers could be named that believed Jesus died spiritually. However, the most important ones were the ones that wrote the Bible. The Bible is clear that Jesus died spiritually. If He did not, then not a single person is born-again. Jesus’ physical death washed away our personal sins however we still have the problem of being children of the devil. No, we must be born-again which is a spiritual process that had to be obtained in the spirit realm. Nothing in this physical realm, even Jesus’ body, could obtain a spiritual redemption. That which is flesh is flesh and that which is spirit is spirit. We needed a spiritual redemption to become born-again children of God.